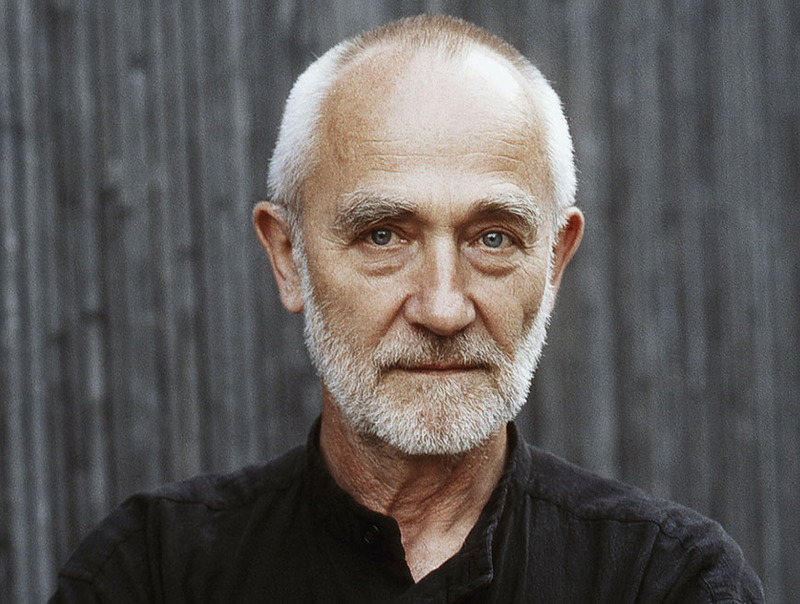 I consider Peter Zumthor one of most rigorous architects around, a man which severe and clutter-free vision of architecture is an antidote to that “starchitects syndrome” which is poisoning an ethically and formally rigorous approach to design. 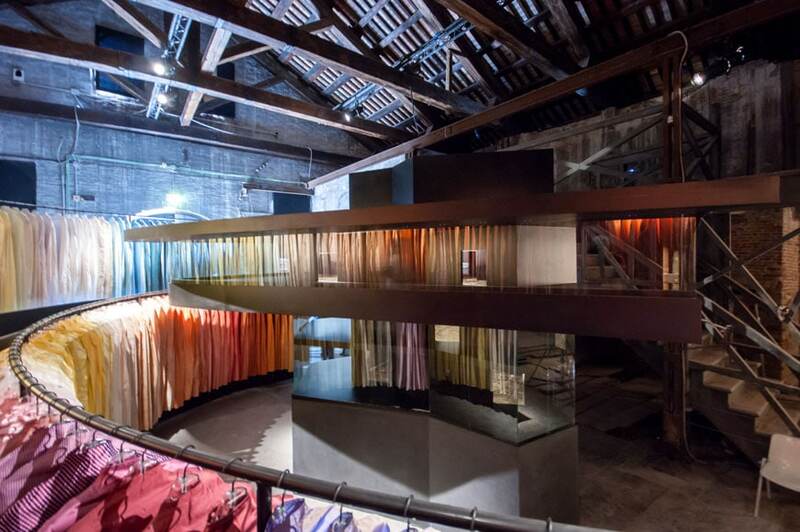 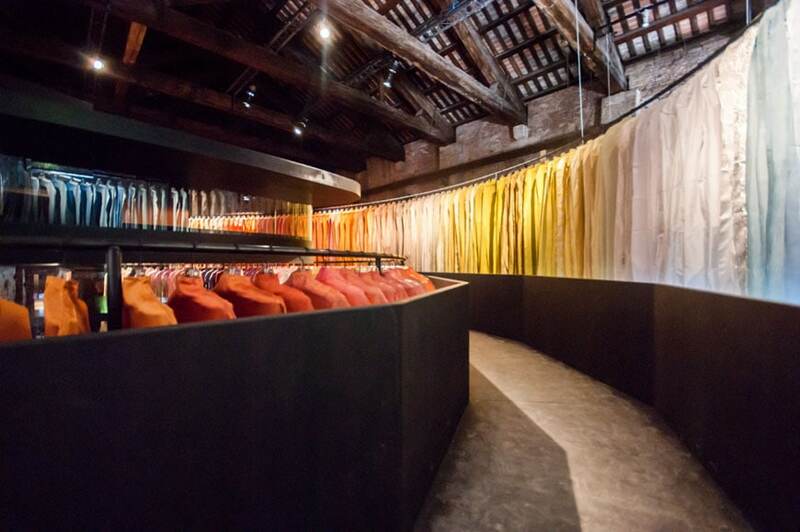 So, I was a bit surprised to discover that a strange, colorful yet well far from being minimalist, installation at the 15th Venice Architecture Biennale, was actually a presentation of the Swiss architect’s design for the new home of the Los Angeles County Museum of Art. 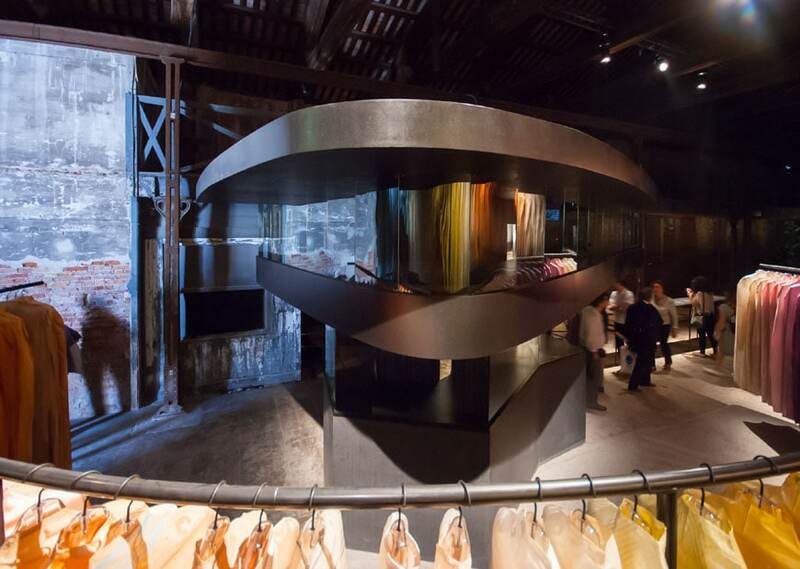 At first sight, the installation was composed of a circular array of textiles conceived by South-Korean fashion designer Christina Kim; yet, by looking more carefully, I realized that the garments were actually encircling a large black object. 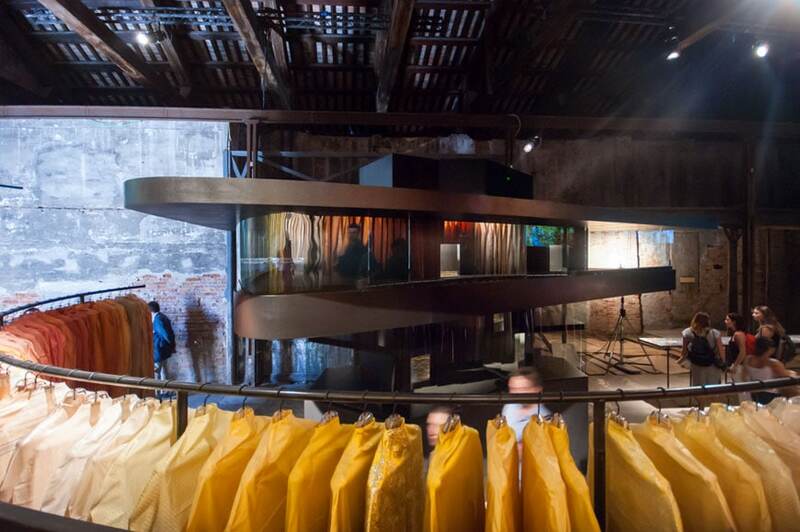 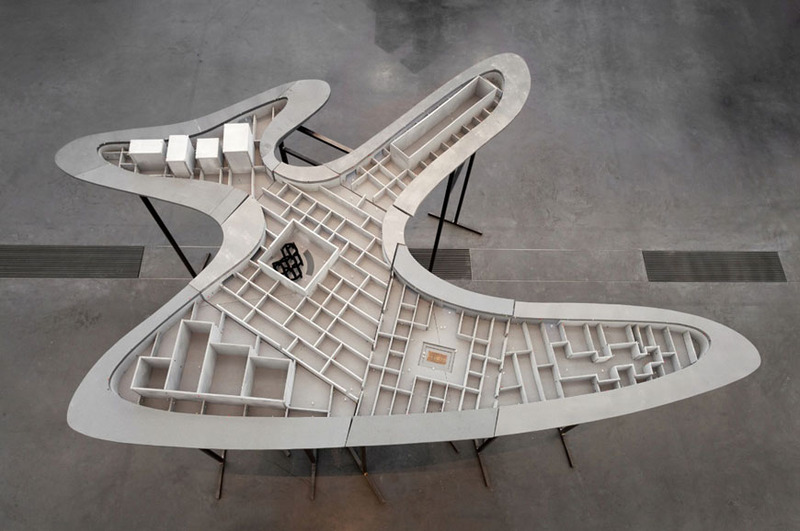 I already knew that something by Zumthor was on view in that area of the Venice Arsenale and investigating a bit further I discovered a panel stating that the “object” was a sample – apparently at 1/5 scale – of his LACMA’s extension project. 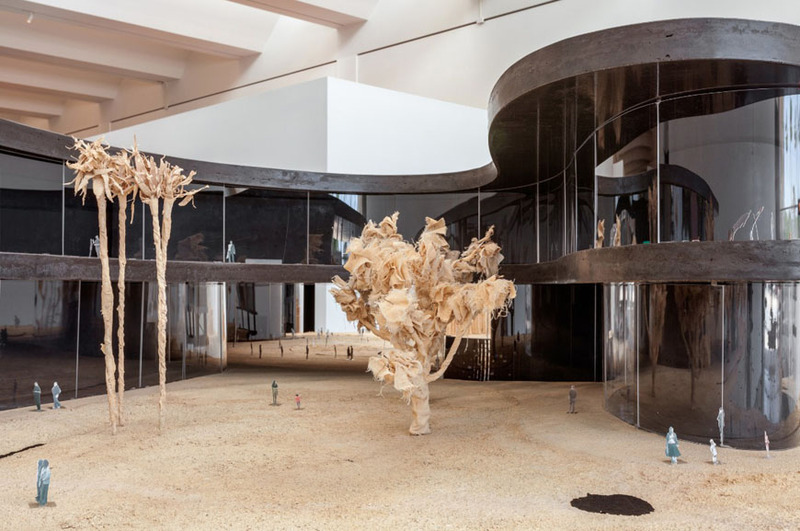 To be precise, the exhibition was entitled The work of Peter Zumthor from a small village in Switzerland, an allusion to Zumthor’s office being located in a remote Swiss settlement with a population of barely one hundred people, and perhaps an attempt to match the installation with this year’s Biennale’s social-oriented theme “Reporting from the front”. 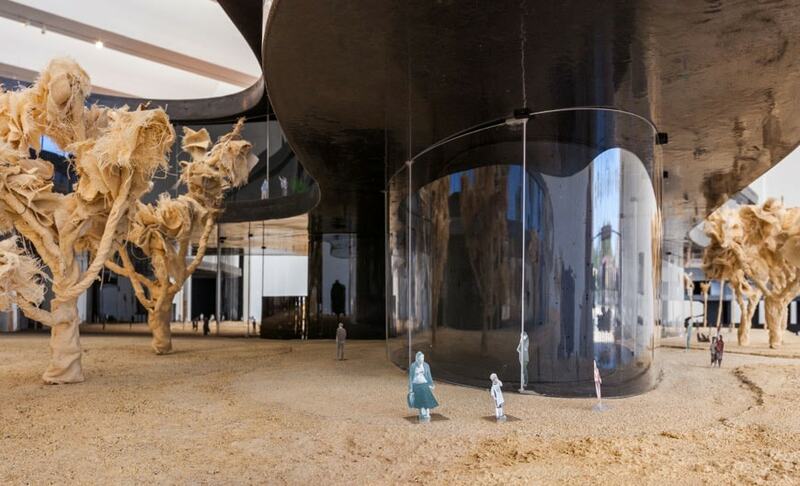 The installation presents only a small part of the project by Zumthor, namely, the museum’s Art House Tower. 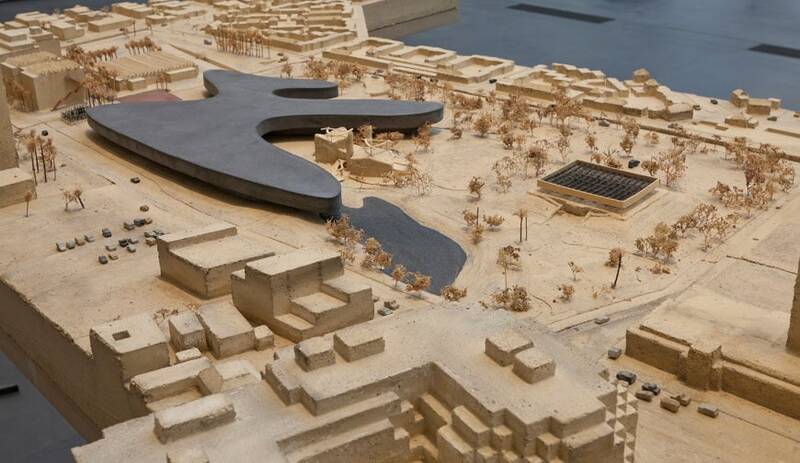 Indeed, the new LACMA’s east campus will be a monumental building, over 700 feet long and with a construction budget of some 650 million US dollars. 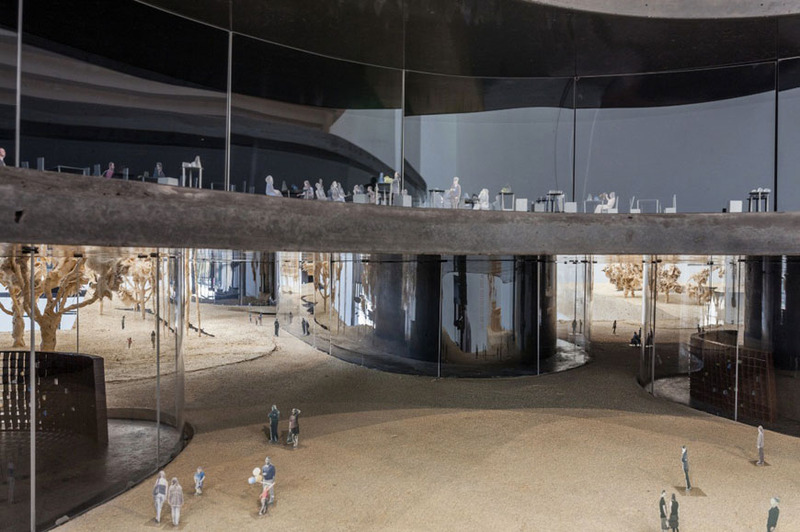 Dubbed Black Lily, the project ” is an organic shape, like a water lily, floating and open with 360 degrees of glass facing Hancock Park, the La Brea Tar Pits, Wilshire Boulevard, Chris Burden’s Urban Light, and Renzo Piano’s new galleries “ (from Peter Zumthor’s design statement). 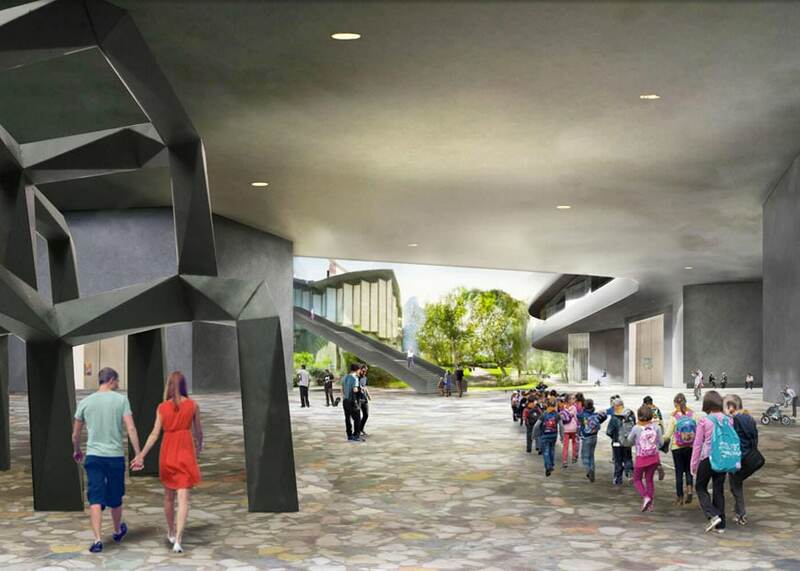 The new project, aimed to redesign the eastern part of LACMA’s campus, will replace an unordered ensemble of structures, mostly built in the ’60s, and will complement the array of new pavilions, located in the western side, completed between 2008 and 2011 after a design by Renzo Piano Building Workshop. 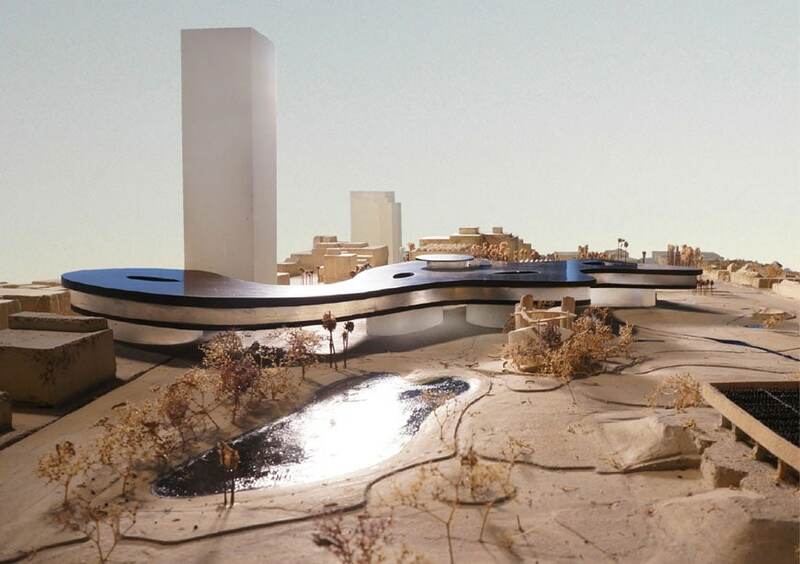 Zumthor’s single-story 400,000 square foot building, first unveiled in 2013, is a surprisingly curvilinear total-black bridge-like structure; stylistically so far from its “usual” designs that some architectural critics commented that the new museum’s spiraling construction resembles a design by SANAA more than one by Zumthor. 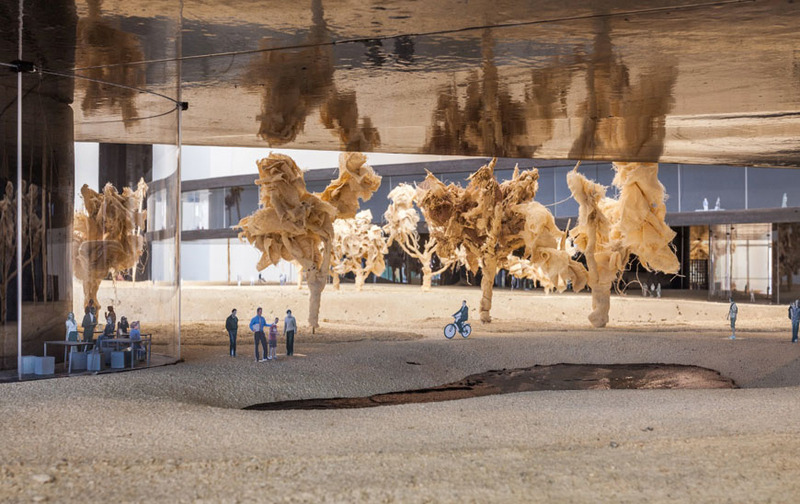 Nevertheless, the Swiss architect’s concept is much more sophisticated than an inattentive viewer could deem and reveals a personal and original approach to the design of large art venues. 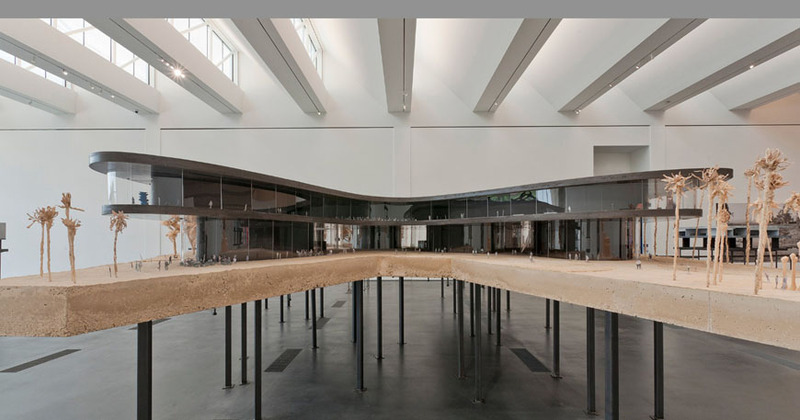 For example, the architect reversed the typical layout of many modern museums by moving the main circulation near the outer side of the building rather than making it barycentric; as Zumthor says “Primary circulation is achieved by this curving perimeter—a continuous veranda rather than a classical Beaux-Arts spine. 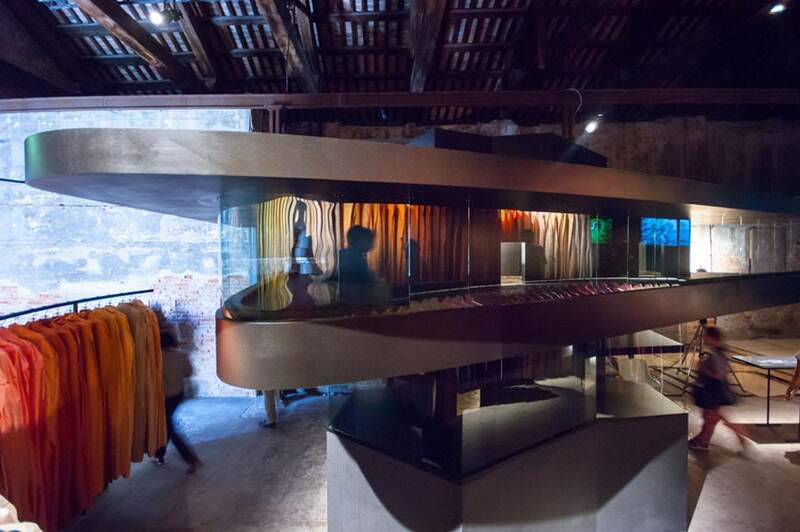 Visitors can look out; those outside can look in”. 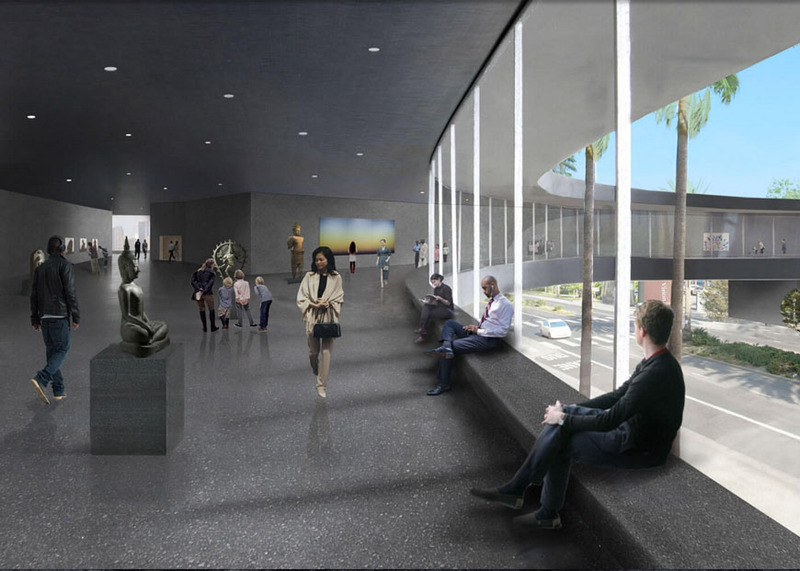 The new LACMA building is clearly intended to cope with the surroundings through transparency, both in the form of a visually and physically permeable ground floor and through a broad adoption of curved glass facades. 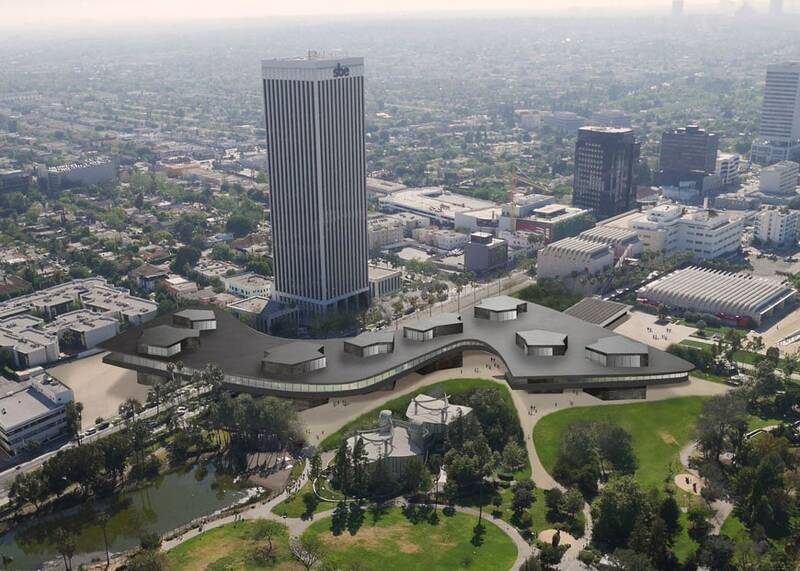 Nevertheless, I am rather perplexed by the decision to paint the whole structure in black; even if the museum’s roof will be covered with a monstrous amount of photovoltaic panels, I wonder how a building so dark will behave in the hot summer climate of Los Angeles from a thermal perspective. 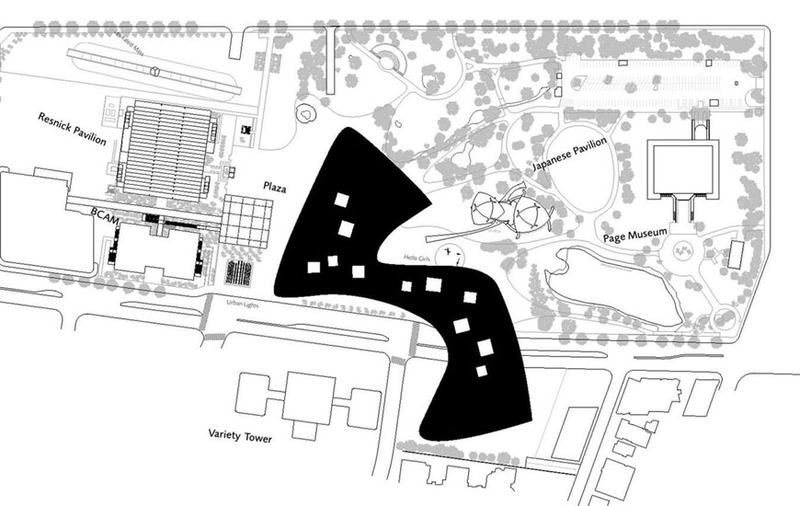 The project was revised in 2014, after some complaints were made about its environmental and aesthetic impact on the site, and specifically on the protected area of the La Brea Tar Pits; yet, it still retains much of its original curvilinear shape, as well as it being raised more than 30 feet over the ground. 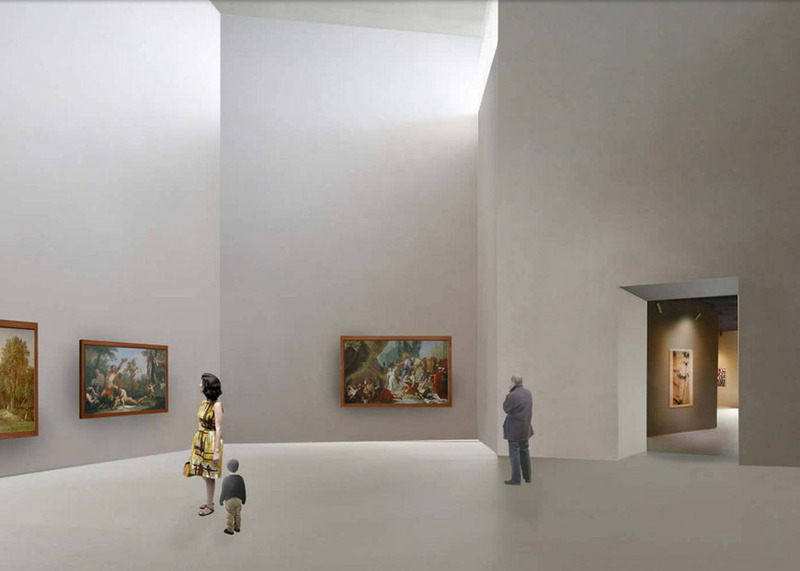 The new east campus of the Los Angels County Museum of Art is scheduled for completion in 2019.